The Marketing Audit Handbook today! Please note: Due to South African Reserve Bank (SARB) regulations, payment for this product can only be made in South African Rand (ZAR) - click here for currency converter. Chartered Marketer and Senior Marketing Professional, shares his insights for conducting a successful marketing audit - resulting in a marketing program with a real competitive edge! A marketing audit is perhaps the most neglected strategic activity in a company! It is one of the best kept secrets – an intelligently and skillfully conducted marketing audit is a sure-fire way toward corporate excellence! How to conduct a marketing audit ... and save time and money in the process! Do you want to improve new product success and improve your customer retention rate? Is your business currently “under-performing” and lacking the “edge”? Do you want to learn more about marketing audits and save time and money in the process? If yes, then The Marketing Audit Handbook is for you. In this revised and updated e-book, The Marketing Audit Handbook, Dawid J. Malherbe shares with you information that can help to unlock your organization's skills, resources and capabilities. He will show you how to save on your next audit and how a marketing audit can improve your business’s overall performance! 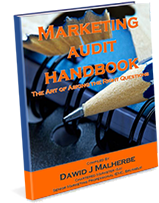 Why The Marketing Audit Handbook? Many companies think they don’t need to conduct a marketing audit, that is, until they see that the ‘writing is on the wall’. Unfortunately, by then the cash-flow of the company is so impeded that the business cannot afford to conduct one. Because, carrying out a marketing audit can be quite expensive! Why? It is done by highly skilled and specialized marketing professionals. A marketing audit should be done quite regularly, add to this that it takes time (money!) to orient and familiarize the auditors with the business’s industry, operations, culture, value systems, strategies, structure, level and nature of competition, distribution channels, etc, etc, and you will appreciate why such a important and necessary procedure is often ignored and neglected. In the end it is mostly innovative and progressive companies engaging in it, helping them to retain their pioneer status in the market – since marketing audits invariably help a firm to identify the real essence of that which makes it unique, i.e. its skills, resources and capabilities. I will go so far as to make the following assumption: identify those superior skills, resources and capabilities (that is unique to the company) and the end result will be acquiring a sustainable competitive advantage for your product, SBU, or/and organization – now that’s a nice prospect! The Marketing Audit Handbook is essential material for the “can do” entrepreneur, marketing consultant, and business executive who aspire to discover their company’s (or client’s) unique and leveragable strengths. Use the e-book and its extensive list of 130 questions and relevant and value adding auxiliary material at your next board meeting – still better, arrange a two-day workshop, with a facilitator and decision-makers and discuss the questions. Remember to give each group member a copy of the e-book in advance so that they can come prepared! You will be astounded at how the The Marketing Audit Handbook will help to release your team’s creative ability! The thought provoking The Marketing Audit Handbook can save you lots of time and money on your next audit – providing you with the strategic information necessary to implement a marketing program that may propel your company to superior performance! View the e-book's Table of Contents. A marketing audit is a periodic, comprehensive, systematic and independent investigation into the organization’s marketing environment and specific marketing activities, with the aim of identifying opportunities and challenges and to recommend action plans in order to increase the organization’s marketing efficiency. The art of conducting a successful marking audit lies primarily in asking the appropriate questions, intelligently. AND it’s not taught in Business School or in marketing textbooks! Order the e-book now and save time and money on your next audit ... and learn how to ask the right questions, intelligently! Yes, I would like to register and download The Marketing Audit Handbook and also get access to Cresta Marketing’s members' area, where I can download and utilize free marketing resources … for only $10.95. Click for currency converter. I have read the Review & Disclaimer and would like to download The Marketing Audit Handbook. Order and download The Marketing Audit Handbook today for $10-95!